This is the seventh tutorial of the GeoGebra Intermediate Tutorial Series. If this is your first time to use GeoGebra, please read the GeoGebra Essentials Series. In the Graphs and Sliders posts (click here and here ), we have discussed how to use number sliders. In this tutorial, we use the Angle slider to rotate a triangle in order to show that its angle sum is 180 degrees. This is the same GeoGebra worksheet shown in my Parallel Lines and Transversals post, but we will change some of the labels. Although this tutorial is the seventh of the GeoGebra Tutorial Series. 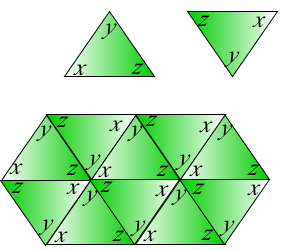 Figure 1 – Rotated triangles using sliders. The construction will start by drawing line AB and constructing triangle ABC using the Polygon tool. Afterwards, we reveal the interior angle measures of the triangle and create two angle sliders namely and . Next, we rotate the triangle 180 clockwise about the midpoint of BC producing triangle A’B’C’ (see Figure 1-B). We then repeat the process, and rotate triangle A’B’C’ 180 degrees clockwise about the midpoint of A’C’ to produce A’’B’’C’’. 1.) Open GeoGebra and select Geometry from the Perspectives menu. 2.) Click the Line through Two Points tool, and click two distinct locations on the Graphics view to construct line AB. 3.) If the labels of the points are not displayed, click the Move tool, right click each point and click Show label from the context menu. 4.) Click the New Point tool and construct a point C not on line AB. 5.) Display the name of the third point. GeoGebra would automatically name it C, otherwise right click and rename it C. 6.) Click the Polygon tool and click the points in the following order: point A, point B, point C, and click again on point A to close the polygon. Your drawing should look like Figure 1. Figure 2 – Triangle ABC on line AB. 7.) Move the vertices of the polygon. What do you observe? 8.) Now we construct two angle sliders and . To do this, click the Slider tool, and click on the Graphics view. 9.) In the Slider dialog box (see Figure 3), choose the Angle radio button, and then leave the name angle as . In the Interval tab, choose 0° as minimum, 180° as maximum and 1°, and then click the Apply button when finished. 10.) Using steps 8-9, create another slider with the same specifications shown in Figure 3 and name it . 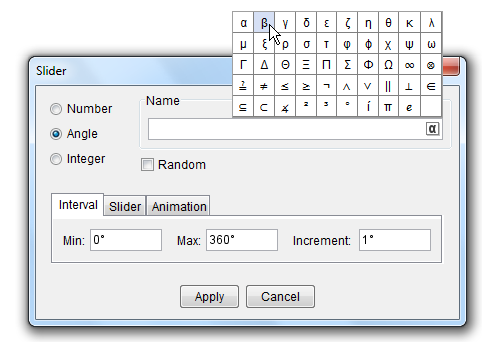 You can find the Greek letters by pressing the button located at the right of the text box. 11. ) 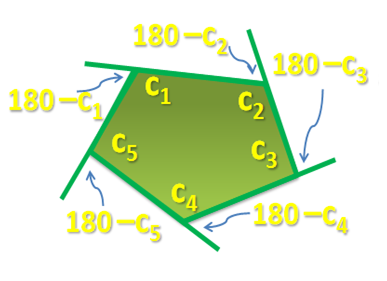 We reveal the angle measures of the interior angles of the triangle, the change the colors of the angle symbols (green sectors). To do this, click the Angle tool and then click the interior of triangle ABC. 12.) We now hide the measures of the angles. To do this, right click each angle symbol and uncheck Show label from the context menu. 13. We set angle colors: angle A red, angle B blue and angle C green. To change the color of the angle symbol of angle A, right click the angle symbol (not point A) and click Object Properties from the context menu to display the Preferences window. 14. In the Preferences window, click the Color tab and choose the color you want from the color palette then click the Close button. 15. 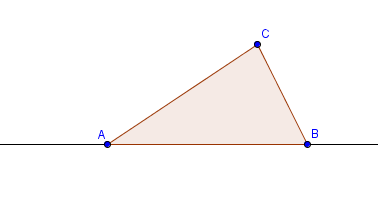 Change the color of angle B to blue and leave angle C as is. Your drawing should look line Figure 1-A after step 15. We already have the sliders ready. The next thing that we will do is to rotate the triangle. The idea is to create a rotation point. Our choice would be the midpoint of BC. That is because if we rotate ABC by 180 degrees producing A’B’C’, angle A’C’B’ will be adjacent to angle ABC (see Figure 1-B). This is also the idea when we rotate A’B’C’ producing A’’B’’C’’. 1.) To construct D, the midpoint of BC, click the Midpoint or Center tool, and click side BC (the segment, not the points). 2.) Note that we want ABC to rotate around D degrees clockwise. To do this, choose Rotate around a Point by Angle tool, click the interior of the triangle and click point D to reveal the Rotate Object dialog box. 3.) 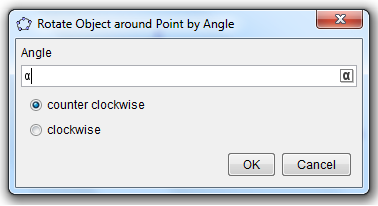 In the Rotate Object around Point by Angle dialog box, change the measure of the angle to , choose the clockwise radio button, and then click the OK button. 4.) Now move slider . What do you observe? 5.) Adjust slider to 90 degrees, and show the labels of the vertices of the rotated triangle. (Refer to Part I – Step 3). 6.) 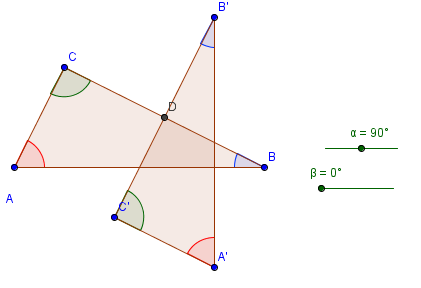 While the triangle is still rotated 90 degrees, click the Angle tool and click the interior of triangle A’B’C’. Hide the labels of the angles symbols. 7.) Change the colors of the angle measures. Refer to Part I – Steps 13 through 15. Be sure that angle A and A’ have the same color, B and B’ have the same color, and C and C’ have the same color. Your drawing should look like the drawing in Figure 6. The idea of creating the third triangle is basically the same as that of creating the second triangle, so I will just enumerate the steps and left the construction as an exercise. Rotate triangle A’B’C’ degrees clockwise around the midpoint of A’C’. (Refer to Part II – Steps 2 – 3). Reveal the labels of the vertices of the third triangle which is A’’B’’C’’. (Refer to Part II – Step 5 and Part I – Step 3). The explanation of the theory behind this construction is in my Parallel Lines and Transversal post. In the angle sum of a triangle post, we have discussed that the angle sum of a triangle is degrees. In the angle sum of a polygon post, we also have discussed that and that the angle sum of a polygon with sides is . For example, a pentagon has sides, so the sum of its interior angle is degrees. Figure 1 – The interior and exterior angles a triangle and a quadrilateral. The angle sums that we have discussed in both blogs refer to the sum of the interior angles. What about the exterior angles? The exterior angle is formed when we extend a side of a polygon. In the triangle above, is an exterior angle. The sum of the interior angle and the exterior angle adjacent to it is always degrees (Why?). 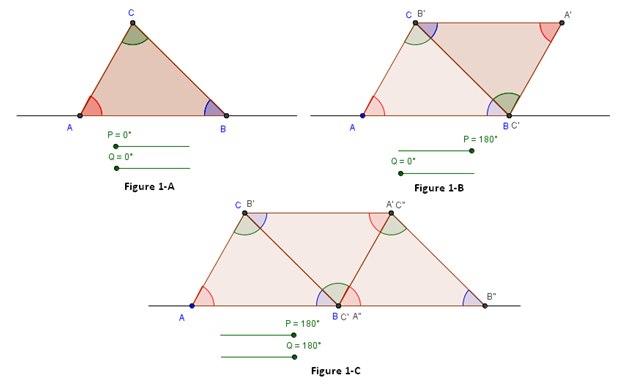 Angles whose sum is degrees are called supplementary angles. If two angles are supplementary, we call them a linear pair. For example, angles and are supplementary angles and at the same time a linear pair, so degrees. Now this means, that . Therefore, if we want to compute the measure of an exterior angle adjacent to an interior angle, we can always subtract the measure of the interior angle from as shown in Figure 1. Observe the computation in the two diagrams. If we let be the angle sum of the exterior angles of a triangle, then . Rearranging the terms, we have . But is the sum of the interior angles of a triangle which is degrees, so degrees. Now, try calculating for the sum of the exterior angles of the quadrilateral above. What is your answer? To verify our hunch, we will try to compute for the sum of the exterior angles of a pentagon.
. Simplifying, we have . But according to the angle sum theorem for polygons, . Therefore, degrees. We have three polygons – triangle, quadrilateral, pentagon – whose angle sums of exterior angles are always degrees. Now, is this true for all polygons? Try to compute polygons up to sides and see if the sum is degrees. which means that the exterior angle sum = 180n – 180(n – 2) = 360 degrees. More formal proofs using these arguments are shown below. Theorem: The sum of the measure of the exterior angles of a polygon with n sides is 360 degrees. Therefore, the sum of the exterior angles of any polygon is equal to 360 degrees. Let a1, a2, …, an be measures of the interior angles of the polygon with n sides. Since each adjacent interior and exterior angle is a linear pair, it follows that the measure of the exterior angles adjacent to them respectively are 180 – a1, 180 – a2, …, 180 – an. 180(n – 2), so, S = 180n – 180(n – 2) = 360, which is want we want to show.